Check your body control module (BCM) wires, everybody. Alright so in the last two weeks I have seen three cases locally where the BCM fuse popped, the car just died, or things like windows/door locks randomly would not work and then work again. 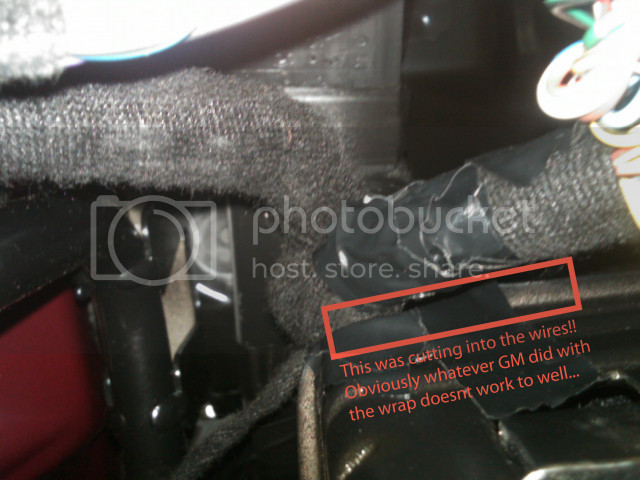 Looking around here there are several threads on it and it's found to be the BCM wiring harness that rubs against the metal support behind the glove box and many were saying it's only an 04 issue but it's every year. The first two that I heard of locally were 05-06 cars and I just checked mine and it was on it's way with a few of the wires being visible and damn near rubbed through already. Below are a few blurry pictures showing the harness and what I did to remedy it. If it hasn't happened to you I GUARANTEE IT WILL in the future so fix it now before you are buying a new BCM, etc. I electrical taped the harness up and cut a length of rubber hose to wrap over it, then zip tied it tight so it won't go anywhere. I also put a few strips of electrical tape over the sharp metal edges of the support bracket that was rubbing it. We put foam padding on the sharp metal edge. Funny though. Since this was the first experience with it we didn't check the BCM fuse at first. We were looking at a ton of options, including bad keys lol. Checked every other fuse, but not the BCM haha. Will take a look before problems start happening. Thanks for the heads up and pictures. I will check today. I would like to check this too. I haven't gone to look yet, but what is needed to pull the glove box? Does the tray just slide out or does the door have to come off? Screws and/or clips? Thanks. “A bird in the grill is worth two in the bush." Other symptoms of this is gauge cluster faults and ABS warnings, TCS warnings, fuel gauge errors, AC turning on and off etc. My BCM was replaced by the previous owner (bought the car 2008) but the problem was never fixed. I only had issues in hot weather. I fixed it myself, went to the dealer 3 times and they could not figure it out. I've commented on this and posted pictures like other have also... This is not a new problem, but there is no 'definitive' write-up (this one is quite good) to maybe add to the KB?? 2001 Opel Omega 2001 2.6l - "big block"
This has been a known issue for a long time. More common on the '04s but does happen on '05s and '06s. Definitely the cause of many strange and intermittent symptoms and no doubt a few unnecessary BCM replacements. There have actually been a few fires from this problem with at least one or two total losses. Whether you get just a blown fuse, odd symptoms, or a raging inferno will depend on what wires are cut into and how often and how long they make contact with the frame. Correct, this is not a new problem and is a known issue but I can't believe there isn't a sticky about this when it WILL happen to every 04-06 GTO out there in due time. It's not a year issue, it's a mileage issue. I've added it to the sticky that will eventually be a concentrated list of important threads. Thanks for the pictures to go with the warning. On an internet forum, the written word is the sole means by which intelligence can be judged. If you butcher the language, particularly with ricer textspeak, you are, in my estimation, not worth engaging. If I can discourage you from being here, I will. Thy rod and thy staff... they comfort him. What is the average miles that this issue is being seen? Where is this exacly and what do you have to do to get to it? Since Guns Kill People, Spoons Cause Diabetes. It's not really a mileage issue, it's more of a sloppy build issue. It falls into the same category with the fuel lines and vacuum hoses that rub under the hood- wiring and plumbing not secured and dressed properly to avoid damage from contact and stress. These problems were first observed not long after the first Goats hit the road over here, when they didn't have a lot of miles on them. IMO it has a lot to do with things that were relocated or modified for the RHD-to-LHD conversion, some of the final detail work was half-assed. To really get a good look at the BCM harness you should remove the glove box. So if a car has been daily driven for most of its life, this would have come up before? I don't have my book for somereason. How do you remove the glove box? As these cars get more miles on them it's going to take it's toll. There isn't a single GTO I have seen that after pulling the glove box hasn't had some rubbing there. Obviously some are worse than others but as the miles pile up it's going to eventually rub through. Half-assed engineering that should have been addressed, yes but it is going to become more of an issue with the mileage these cars are starting to get to now. I was partly kidding. Has anyone had to re-work the harness? IE patch some wires and re seal. I just saw this thread. Never heard of this before and I have a random ABS fault showing up. I am now concerned that this might be my issue? Location: Goodyear, AZ. - Because I like the tires. Good write up! I am going to check mine this weekend! 1968 Retro style 06-M6 QSM 18 inch wheels. I havent seen this before and being I just rolled over 115k, I went out to check. Never realize glovebox just popped out, lol. Im in good shape! I could put my fingers over the support brace and the harness barely touched my fingers. No signs of rubbing either. Reading this, my intermitent ABS fault and failure warnings (which occur when I hit a bump on that side of the car), has me worried now. I can just picture the wires half worn through and laid open. prolly 22 ga too. this is probably why my airbag light keeps coming back on after they clear the code. Gonna check it out. https://www.ls1gto.com/forums/showthr...lovebox+remove I found this on how to remove it unless anyone has any better input. good heads up. went out and checked and sure enough the fabric was cut through and 2 wires were next. I have only about 20k on my 05. this should def be a sticky. thanks for the info! i'll be checking mine when i get home. 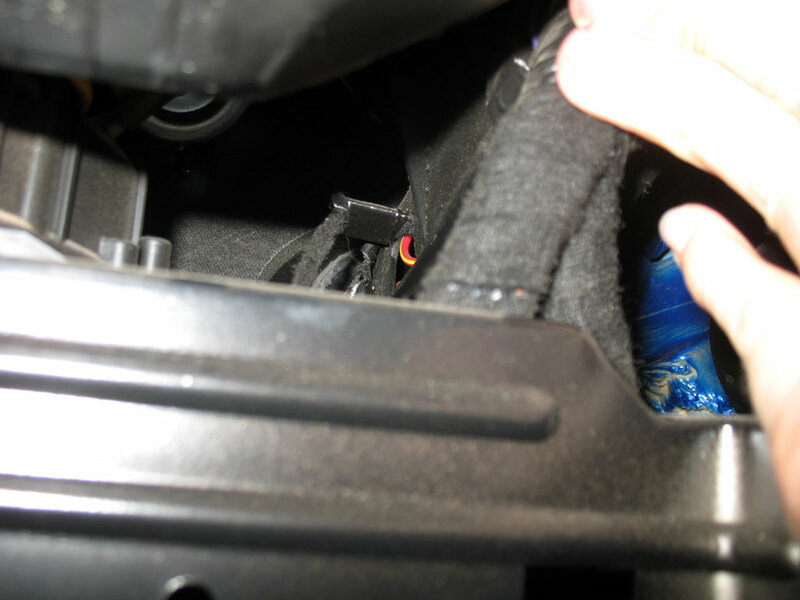 I have been trying to figure out how to remove the glove box door without breaking something (the turned up a lot of people with sagging glove boxes). 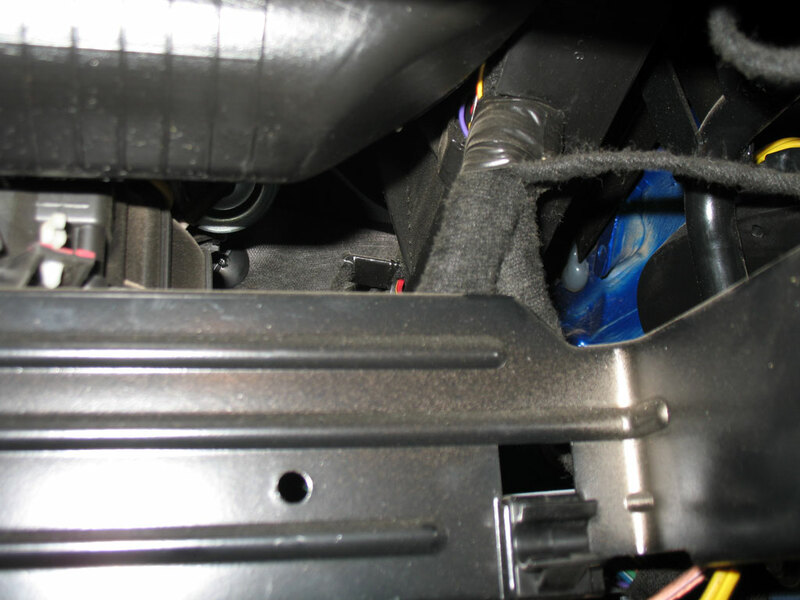 Depending on your size and determination, you should be able to slide up underneath the glove box and take a look/fix. I could see what looked like an impression on the cloth harness covering made by the metal plate, so I shoved some foam up in there between the harness and the plate. 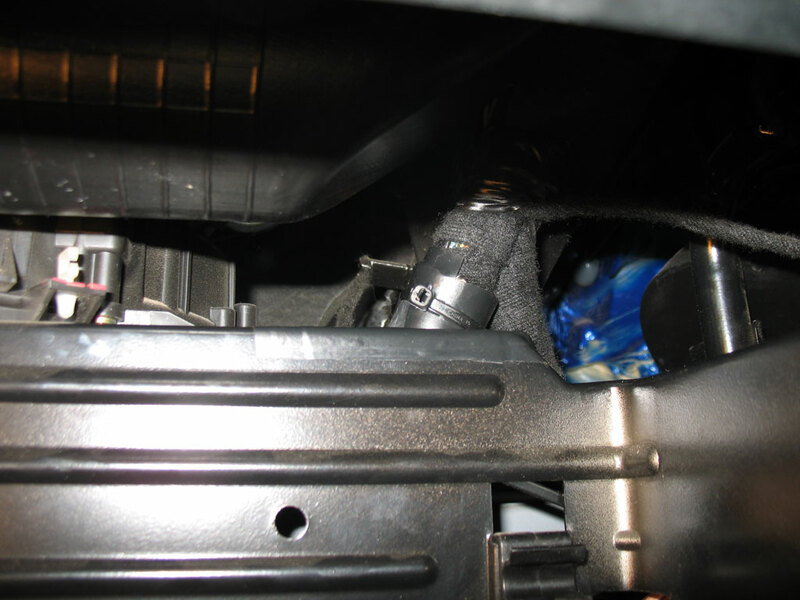 Here are two pictures looking up at the harness from underneath, with the glove box door still in place. Before and after. Great info to have! I'll be checking mine tomorrow for sure. I get that same ABS Fault once in a while also. Sometimes I get a brake shutter problem and never the fault, and usually get the fault when just sitting still. Guess I'll be checking this tomorrow. May I quote you on that? Blown H/C 408 and other stuff. Billet tires. Plasti Dip tints. Stage 3 keyboard. /////. 2017 Cruze diesel A9 MPG queen. Rollin coal w / my balls in spacious glove compartment.